WHY DO INNOCENT people suffer while wicked people prosper? How do we maintain our faith during challenging times? How can we have free will if God knows everything we do? The book of Iyov has a reputation for being one of the most challenging of all the books of Tanach. Written in obscure though beautifully poetic language, it deals with such profound concepts as human and divine justice, faith in the face of challenges, the nature of good evil, reward and punishment, divine providence and free will. The story of Iyov is about the suffering and faith of a righteous man. In a series of debates with his companions, Iyov attempts to understand his tragedy while his friends comfort and strengthen him. These dialogues encompass the deepest mysteries of nature and spiritual existence. During these challenging times, we find ourselves, like Iyov, asking questions and looking for ways to strengthen our faith. What better way to find answers than to turn to the source—to the sefer of Iyov itself? The commentary of the Malbim opens up for us sefer Iyov on a profound level. His eloquence and penetrating brilliance makes Iyov accessible and understandable. His narrative style brings the story of Iyov to life, giving us an appreciation for the beauty of this sefer. RAV MOSHE SHERER was known for his efficiency and precision in just about all areas of life. He once noticed that a form of some sort had been left in the wrong place in the office, and he reacted with a touch of irritation. One of the office workers asked him why something so slight bothered him to such a degree. Carelessness in one area indicates that carelessness exists elsewhere, with the result that things are not as they should be. Eventually the whole enterprise falls apart. 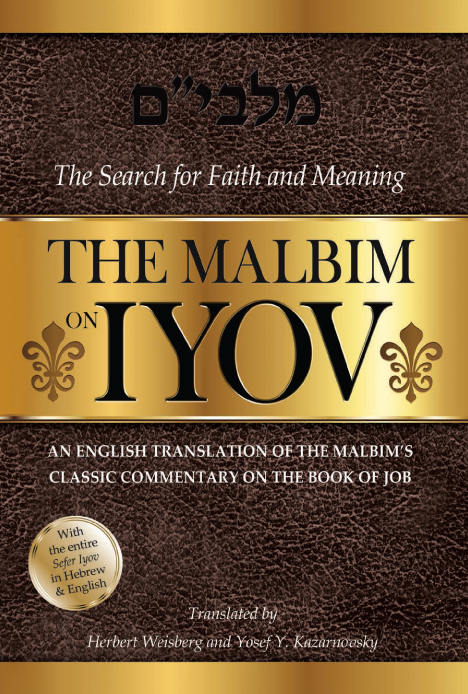 The resplendent cover of The Malbim on Iyov is an indication that a professional and conscientious job follows between the covers of the book. One who spends time looking through this work will find that it is indeed a superb piece of workmanship. The translators’ preface grabs you and kindles your interest. The layout incorporating the Hebrew and English translation of the entire sefer of Iyov is top-notch. But most important, of course, is the translation itself. 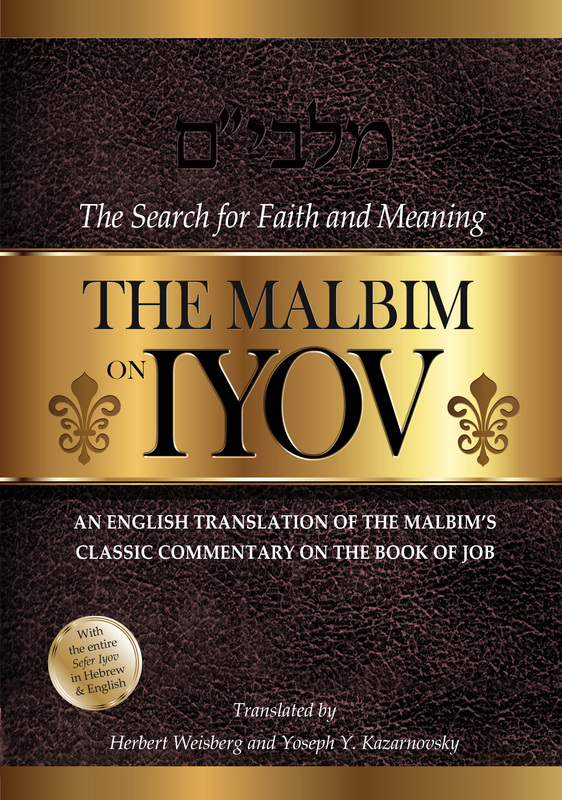 The translators clearly chose their words carefully in order to facilitate clarity in understanding the thickly obscure language and concepts of Iyov and the profound commentary of the Malbim. When the translation of a Torah text comes out, the reaction of many is, “This is absolutely meant for beginners and novices.” However, this is not at all accurate. As the Novominsker Rebbe, shlita, wrote in his approbation to the Hebrew edition of the Schottenstein Shas, “A translation is an entryway for one to gain the basics and then be able to delve deeper.” This translation of the Malbim’s commentary on Iyov, while certainly indispensable for a novice, is just as beneficial for a veteran Torah scholar. When learning the Hebrew original of Iyov and the Malbim’s commentary, one certainly comes away with an understanding of what the Malbim wants to convey. However, seeing it in one’s “mama loshen”—in this case, English—can trigger a new depth of thought that comes from the subtleties of a finer understanding. Everyone at every level can gain from this exceptional work. In any translation, one must strike a balance between literal translation and flowing readability at the expense of accuracy. This is a difficult challenge—especially so regarding the book of Iyov and its commentaries—but the translators succeeded to an impressive degree. All that is left is for the reader to take advantage of this outstanding work. Brand Name Publishing, under the direction of Rabbi Hershel and Suri Brand, has once again lived up to the high standards that has come to be expected of them. THE MALBIM—Rabbi Meir Leibush ben Yechiel Michel—was born in Volhynia, Russia, in the year 1809. At the age of thirteen, he moved to Warsaw, where he rapidly became known as the “ilui from Volhynia.” During the course of his studies, he also studied Kabbalah with the renowned chassidic rabbi, the Admor of Ziditchov. The Malbim authored many original works, but his masterwork was undoubtedly his commentary on Tanach, written over the course of 25 years between 1845 and 1870. These years were also times of hardship. After his long service as the communal rabbi of Kempen, Prussia, he was appointed chief rabbi of Romania, but he was deposed from that post in 1862 at the behest of the proponents of the Haskalah (Enlightenment) movement. After imprisonment and then release into exile, he continued to serve as a pulpit rabbi in various communities throughout Eastern Europe. He passed away in Kiev on the first day of Rosh HaShanah in 1879. [RABBI YOSEF ALBO] notes in his Sefer HaIkrim (4:4) that according to the ancients, there were two views regarding the significance of astrology. Philosophers favored the first view, which postulates that planets and other celestial influences operate in the lower world by the effects of their changing patterns on the fundamental elements [earth, air, fire, and water]. These elements were prepared, molded, and compounded by those influences to comprise the phenomena of nature. It appears that some people are endowed with the ability to comprehend this wisdom while others are not. Similarly, some are endowed with the ability to receive divine prophetic emanations, while others are not. However, we do not assume, according to this view, that planetary forces influence those things that are not within their dominion [i.e., that are not of a physical nature]; for example, whether a person will be poor or wealthy, marry one or many wives, or be fulfilled or unfulfilled in life. Those who endorse this view believe that it would be false and deceptive to presume that the stars can affect matters that are not in their domain, such as poverty, wealth, love, and hate. The second view was the one endorsed by astrologers. They held that the totality of human experience is determined by the stars. Their proof of this came from the perception that astrologers could predict people’s future in minute detail—whether they would live long, be rich or poor, or be fertile or childless, and how many wives they would marry. Their evidence purported to show that all of human experience is governed by planetary influences and that it is impossible to escape this determinism. This was, in fact, the understanding of some of our Sages, who said, “Planetary influences confer wisdom, and planetary influences confer wealth” (Shabbos 156a). Iyov’s view is clearly that of the astrologers—that all human affairs are ordained and fixed through the planetary influences. He lays the foundation for this at the beginning of his response, when he curses the night of his conception and the day of his birth for betraying him (see Iyov 3:2–9). Since the night and day had already seen that he was fated to be unsuccessful, they should have decreed his nonexistence at the outset. Why else should he have been allowed entrance into an existence of grief and suffering (ibid. 3:10–12)? The idea that an existential void [from never having lived] is inherently bad is deeply implanted in the human heart. Therefore, while an individual might be pained by a void in his material existence, such as the absence of wealth, he realizes that it would be so much worse if his entire existence had been made void and he had never come into being at all (ibid. 3:12–16). A person can only conceive of this idea, however, after he has come into existence; he could never have thought of it if he never existed in the first place. Thus a total void—i.e., nonexistence—and a void within existence really amount to the same thing. We are in effect unable to measure the difference between the larger void of total nonexistence and the smaller one of missing something within one’s existence, since there is no difference between one void and another [literally, “between naught and naught”]. As Rambam mentions in his Moreh Nevuchim (3:12), Iyov will expand this view in his subsequent arguments and conclude in favor of the thesis put forward by the sage Al-Razi [a ninth-century Persian physician and philosopher], that there is more evil than good in existence. If you were to compare the periods of tranquility in a human life, and the joy experienced during that tranquility, with the pain, harsh suffering, anxieties, and troubles experienced in that same life, you would find the human condition to be vindictive and a great evil for the individual. In seeking to authenticate his view, Al-Razi enumerated these evils one by one. Most nations of the world, in fact, proclaim in their sayings and songs that while it is a rare miracle to find a good thing in life, evil is abundant and lasting. Moreover, this perversion of time that evil perpetrates becomes even more apparent when one considers the case of a man so poor and miserable that he spends all of his days yearning for and seeking death, but the stars continue to grant him life. Suddenly, one day, he finds a hidden treasure and great wealth and now seeks to live and experience good things. Instead, death now comes to him (ibid. 3:20). It thus seems clear that human affairs are governed by the disposition of the stars and their directives to bring good or bad. We can further infer that the individual is neither self-directed nor free to act as he wishes. Choice and striving are futile, for his actions are fixed down to every detail in accordance with the movement of the heavenly bodies and their influences. Apart from them, he is powerless to better or worsen his condition (ibid. 3:22–24). Iyov brings the most comprehensive proof for this from his own experience (ibid. 3:23–24). Since he considers himself to be a completely virtuous man, he cannot attribute his misfortunes to punishment by Divine Providence for some sin he committed. Furthermore, he cannot attribute them to pure coincidence since his possessions were destroyed in a most supernatural manner. All at once he was overwhelmed by a haphazard pattern of events—wind, fire, and enemy soldiers—all occurring suddenly and simultaneously. This must mean that celestial forces are warring against him and that these troubles must be due to an astrological determinism that was specifically directed against him and causing in one instant a complete reversal of fortune. He has further proof of this in the constant dread he feels regarding an impending misfortune. It is as though his heart foretells a terrible astrological fate and that he is destined for ruin (ibid. 3:25). Despite all of these suppositions, Iyov concludes that since it is impossible to attribute any deficit of knowledge to the Almighty, God must certainly be aware of all that transpires in the lower world. Since it is also impossible to ascribe any injustice to God, the injustice of his situation must have been determined on an astrological level. Thus, from the point of view of reward and punishment, no injustice can be attributed to God, since a man is not free to act but is rather compelled [by astrological forces]. All of this will be clarified with additional proofs that Iyov will provide in arguments that will follow one upon the other.